As well as copying elements between Packages using a diagram, you can also copy features - attributes and/or operations - between elements in a similar way, dragging the features from an element in the Project Browser or Element Browser and dropping them onto another element in a diagram. Open a diagram containing the target element. In the Project Browser or Element Browser, click on the attribute or operation and drag it onto the element in the diagram. 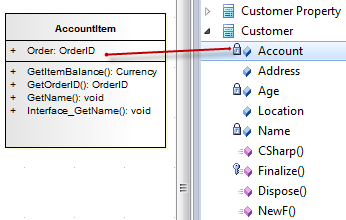 In this example, the attribute Account is being dragged and copied from the Customer element in the Project Browser into the AccountItem element in a diagram. The process from the Element Browser is, visually, almost identical. This image shows AccountItem after the attribute Account has been dropped on to it.